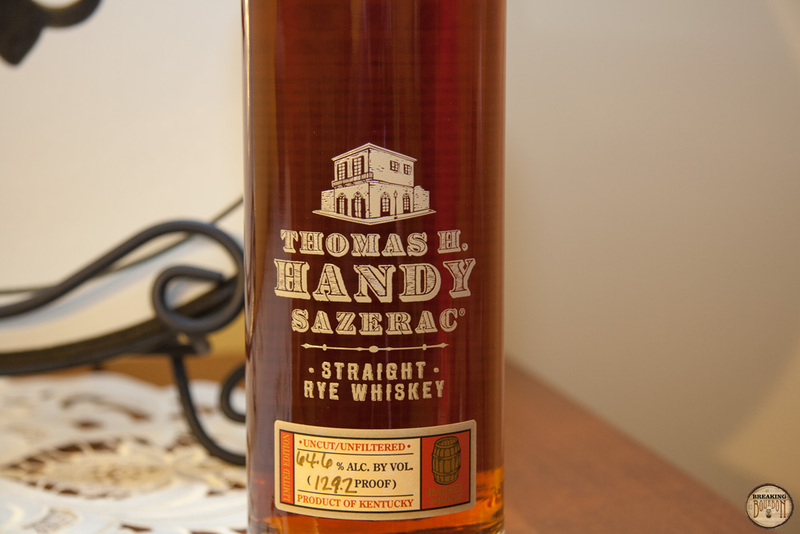 Thomas H. Handy 2014 edition is a barrel proof uncut / unfiltered rye whiskey which was aged a total of 6 years and 3 months at the time of bottling. It came in at 129.2 proof which is slightly more than last year’s, but still in the same ballpark. 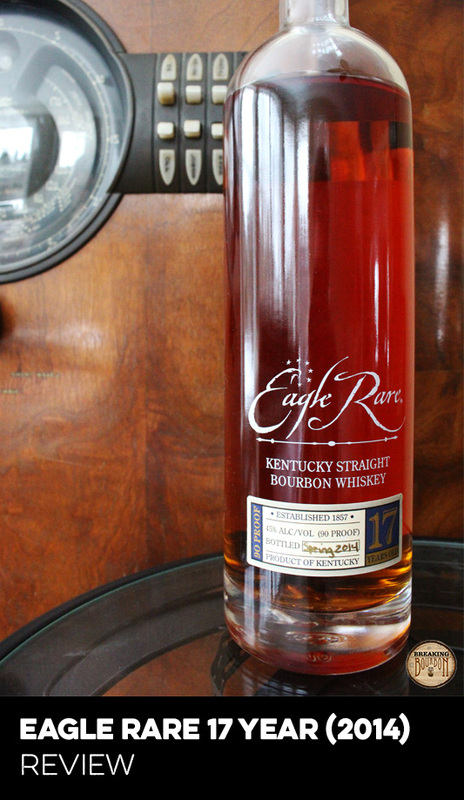 Buffalo Trace hand-picked 47 barrels which saw a 33.24% loss to evaporation. An estimated total of 8,393 bottles were produced. The moment I poured this rye into my glass, a strong burst of alcohol scent filled the air around me. This whiskey is not for the faint of heart. So, it was no surprise that a very strong dose of alcohol is upfront and present on the nose. Behind the alcohol are faint traces of citrus and dried raisins. The 2014 Handy has a very hot flavorful palate. The heat starts the moment the whiskey hits your mouth. 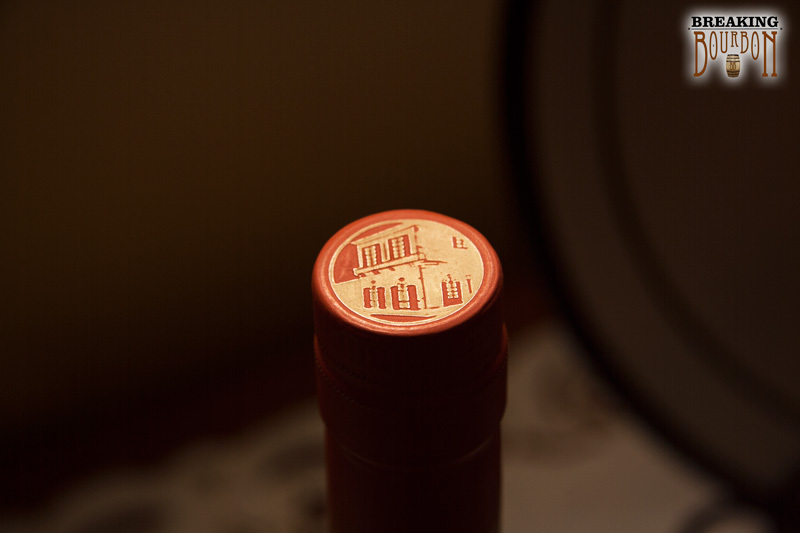 At first, a touch of sweet vanilla is present, which instantly transforms into leather, wood, allspice and rye spice. The finish on this bourbon reminds you of what you’re drinking right to the end - a big, bold barrel proof rye. Hot and full of pepper, this finish lingers with you for a long time. The heat starts on the tip of your tongue and slowly envelops your whole mouth before inching its way down your throat. This by no means is a bad thing, as it’s less of a jet fuel burning sensation (e.g. Stagg Jr) and more of a spicy hot finish that makes you appreciate the uniqueness of what you’re drinking. Sitting 2-3 minutes between sips, you’re treated to subtle lingering notes of dried raisin and hay. The mixture is quite delicious and makes you want to go back for another sip just to experience the very tail end of the finish again. In the microcosm of the BTAC collection, Thomas Handy isn’t the most unique bottle per production numbers. 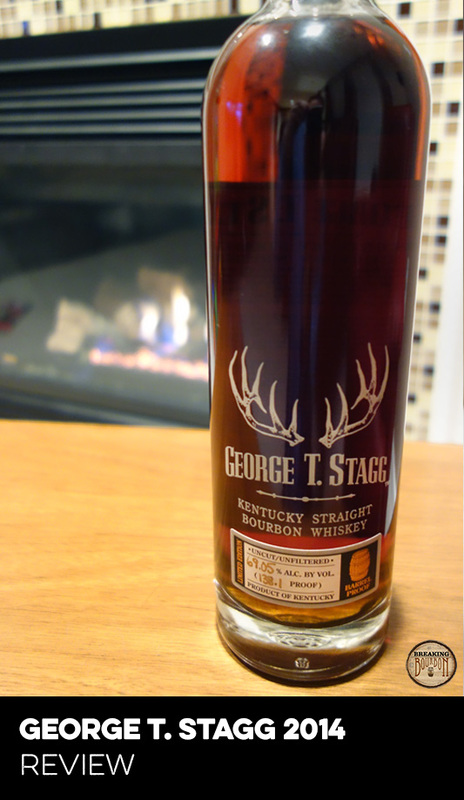 It's actually the second highest produced after George T. Stagg. Compared to other annual whiskeys, I’d consider this a smaller release, as Buffalo Trace still only bottled and released less than 8,500 bottles of Handy this year, making it unique from that standpoint. 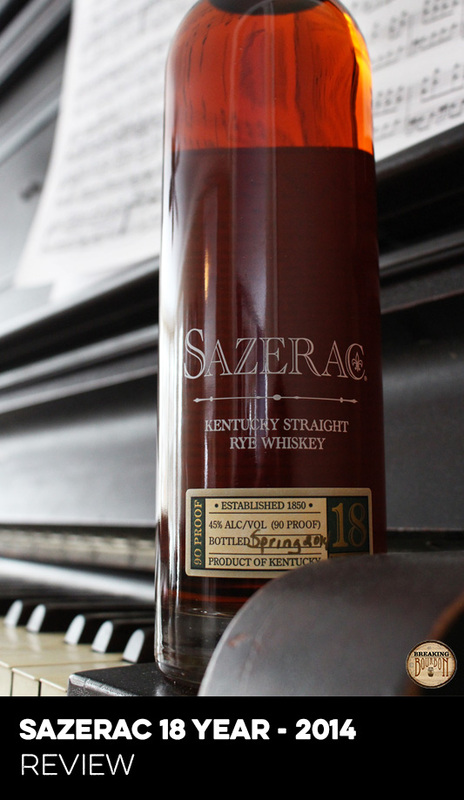 It may be a young rye, but it delivers a big distinct flavor profile that other whiskeys are hard-pressed to replicate. Furthermore, few companies are actively distilling and releasing their own barrel proof aged ryes. Sure you could find aged Willetts as old as or older than the Handy line, but, none deliver the year-over-year consistency that you’re able to find with this whiskey. In a world full of ever-rising whiskey costs, Buffalo Trace continues to offer their Antique Collection at a reasonable price. While the $80 MSRP is $10 more than last year, you’re getting access to the best honey barrels available at the distillery, bottled at barrel proof, and unfiltered. You’re not going to get a better opportunity to taste what the Master Distiller is tasting than with this release of Thomas Handy. A very solid value indeed for a barrel proof uncut / unfiltered rye. Even if it’s the youngest and second most common bottle in the BTAC lineup, it still delivers a special unique treat for those who are able to try it. It's a shame that Thomas Handy often gets overlooked in the BTAC collection due to being more widely produced and younger compared to the other whiskeys in the lineup. 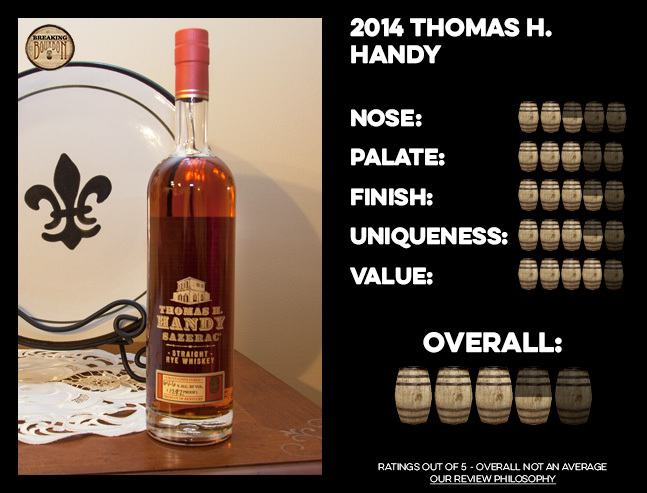 Once again Handy is a quality rye that delivers a great experience to whiskey drinkers. While I don’t find it to be the standout of this year’s lineup or as spectacular as years past, it still continues to be a very enjoyable pour. 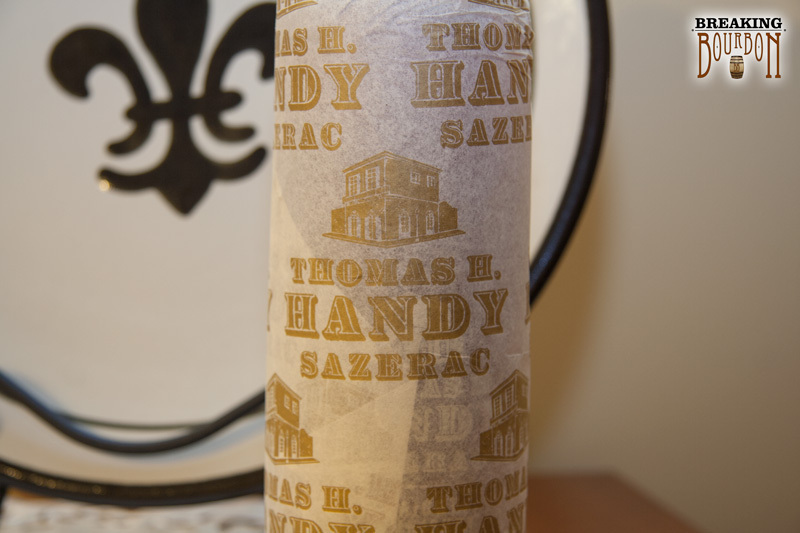 Handy truly is a versatile whiskey that I’d recommend to warm you up on a cold winter’s day or to cool you down on a sweltering New Orleans summer night. If you see a bottle, don’t hesitate to buy it, and definitely share it with your friends when you do.